I realize that gift wrapping is not all that significant in the grand scheme of things, but one thing I have found that many single fathers have in common is a certain tasteless tackiness when it comes to giftwrap. It isn't a major failing, but it's readily addressable and neatly wrapped presents look much nicer scattered about under the tree. It isn't as if this were child abuse or something, but it doesn't exactly fill our visiting family members with faith and confidence in our parenting ability. It can make them wonder if we are fastening diapers to the baby with an electric brad nailer. 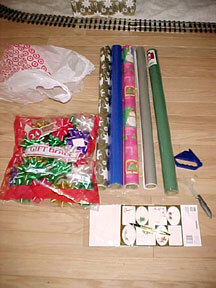 If you have a "Dollar Store," "Thrift Shop" or some similar outlet style retailer, you can buy gift wrap, bows and labels for a fraction of what they cost in most retail stores - even the discount stores like Target, KMart and Walmart are much more expensive. 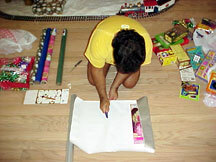 Pay particular attention when buying the paper - some rolls look bigger but don't have enough paper to wrap many presents. I look for rolls with 60 sq. ft. minimum and I buy an assortment with some holiday patterns and some plain colors. I like patterns that I can use for any occasion. 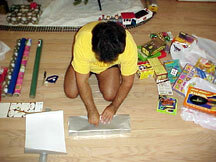 When you begin, start with the biggest packages you need to wrap. 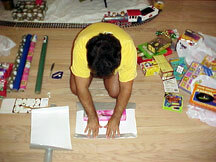 That way, you minimize the chances that you'll be trying to piece together scraps to wrap them later. 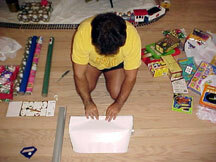 To start, lay the wrapping paper out on a flat surface and position the box you wish to wrap on the paper. Use your paper cutter to cut a section of paper as wide as is necessary leaving enough room on each side to cover the sides of the box. Cut all the way across the paper. Move the box away from you towards the center of the paper just far enough that you can fold the paper half way over the box. Secure it in the center with a small piece of clear tape. 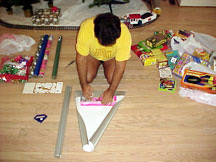 In order to determine where to cut away the excess paper, pull the remaining paper back over the box towards you and then fold it back at the point where it is two or three inches past the edge you taped down. 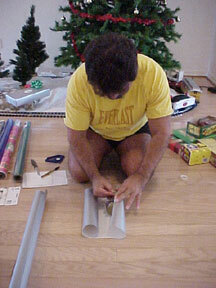 These pictures of me wrapping a different package better illustrate what I mean. 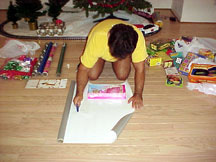 You do not want to cut the paper long enough to reach the taped down edge - you need enough paper to go about two inches past the edge. Returning to the original package, I cut the excess paper off at the point where I had folded it. Then, I folded the edge of the paper back towards me to create a nice, neat edge. I pulled that side back over, covering the package, and secured it with a piece of clear tape. The ends remain open at this time. 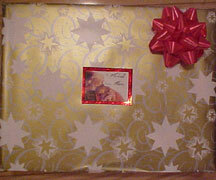 Next, I folded the sides in and creased the paper as shown. 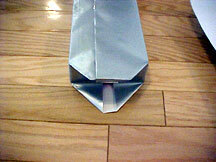 Note that the sides are folded in tightly and the creases are at 45 degrees. 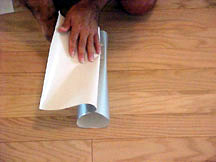 It is very important to be careful with this step and be sure that the paper is folded in tightly and neatly creased. 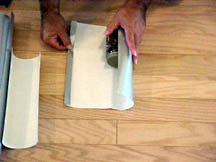 In the pic above, note that the end where the paper joins is folded over. 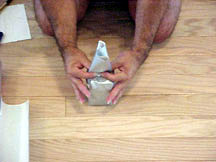 This is the side to fold down first. 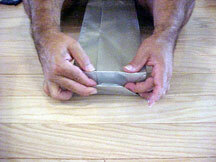 Then, fold the end of the other side over to make a nice finished edge and then fold that up to cover the side that you folded down. Secure it with a piece of clear tape. 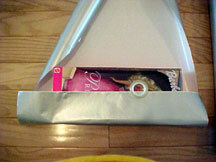 Find a bow that coordinates with the paper color, peel off the backing paper and stick it to your package. Add a label identifying who it is to/from and you're all set. 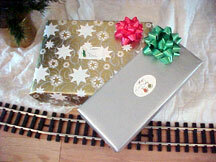 It takes a little practice - start with nice square packages, they're easier to wrap. 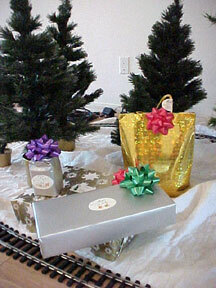 Some packages are a little more challenging to wrap due to irregular shapes. I started wrapping this jar of nuts the same way as the Barbie doll. I cut the paper and then secured one end of it to the jar. 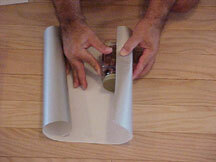 I folded the paper over the jar, past the taped down edge and then folded the excess back to mark the place to cut it. I cut away the excess and then folded the end over to make a nice, finished edge. Once the nice, square sides and bottom were secured, I trimmed the excess and secured the top as as best I could and then covered the top with the bow. 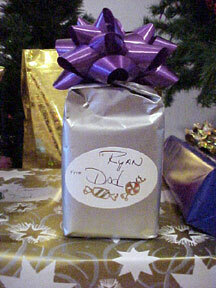 I am sure Martha Stewart could do better, but Ryan will like it just fine. 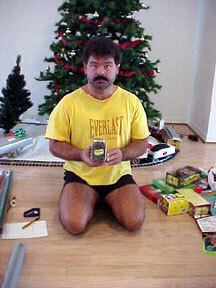 There are some things that simply defy the ability to wrap. In that case, I use gift bags. 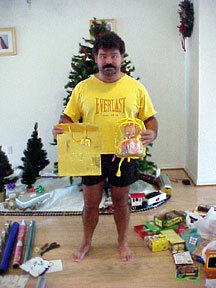 This little plastic backpack with a doll in it would have been tough. These gift bags are ridiculously expensive so I attach the to/from label to the string (see above the bow) rather than sticking them to the bag itself. That way, I can save them and use them over and over again. Speaking of "cheap," this six pack of blow bubbles would be an easy present to wrap but, separated, it makes for six presents the kids get to open. They are going to need lots of blow bubbles to feed the blow bubble machine guns I bought! Two other things I would like to mention. First, if you are afflicted with a "dead beat" former spouse, I think I could understand it if you would not give them a drink of water if their teeth were on fire. I don't have that problem, but I do agree with you; I don't think I would either. Personally, I think dead beat parents should be publicly flogged until they learn how to pray and mean it. On the other hand, I would hope that you would agree with me that a child's Christmas experience should not be diminished in any way that can be avoided. For a young child to get nothing from a wretched dead beat absentee parent is normal; nevertheless, it is also devastating. If I had that problem, I assure you that my child would not. 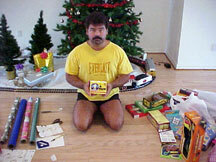 Some guy named Santa gets to look like a hero to my kids, and yours, every year at our expense. It's a lie, but you and I go along with it, and we don't have a problem with that - nor should we. It's for the kids. I don't have a son named Michael, and I don't have a "dead beat" ex, but if I did, this is how I'd handle it. I'd see it exactly the same way. In my house, I steer by the lights as I see them and handle things the best way I know. 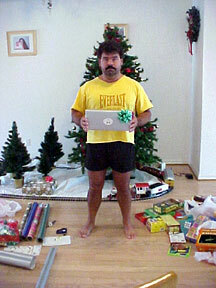 If your ex is too sorry to send the kids something for Christmas, you must do as you think best; my thoughts on the subject are just a suggestion. That brings me to point number two. Children can be smarter than we think sometimes. Let's not allow them to see through our charades because we didn't think to use different wrapping paper, labels and pens. I keep one roll of paper separate just for Santa's presents - that way I don't get confused as to who they are from when they are being opened. 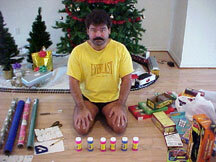 Years ago, my son Jeremy realized that Santa and I had the same handwriting. Busted! 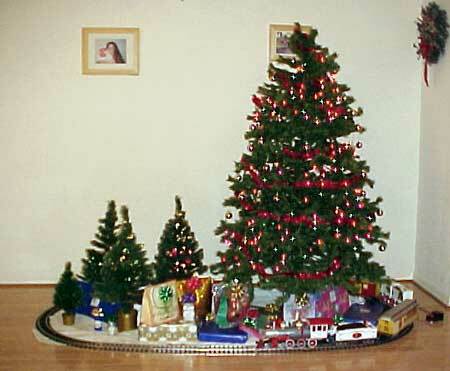 Whatever you do this Holiday Season, do it with your love and you cannot go wrong.